For several years I was the undefeated champion of the Tour de Donut bicycle races in Ohio (2014, 2015, 2016, 2017), Utah (2014, 2015), Illinois (2015, 2016), Austin (2016, 2017), and the Donut Derby bicycle race in Pennsylvania (2015, 2016, 2017). These races are 30+ mile road races where riders earn time credits by eating doughnuts at stops along the race. 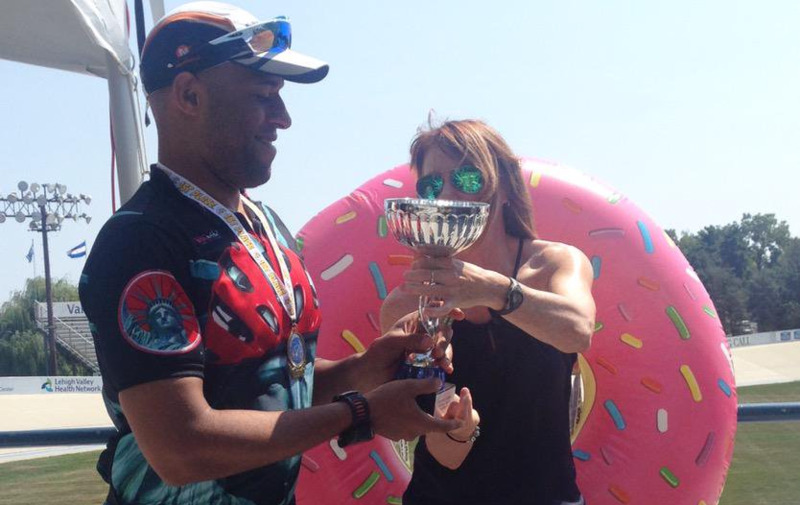 The rider with the best 'donut adjusted time' wins. To win these races, you must ride fast and eat a ton of donuts! My best Tour de Donut-style bicycle race was the 2017 Donut Derby where I ate 61 donuts over 36 miles, for a 'donut adjusted time' of -31 minutes. In 2010, I ran my 1st marathon (NYC), with my wife. In 2016, I finished my 14th marathon (one was a 60km ultra-marathon). In 2012, I finally learned how to swim and I did the NYC triathlon. In 2013, I did my 1st Ironman. In 2015, I finished my 4th Ironman. I have 3 bikes, but my choice for triathlons is my Quintana Roo PR6 Ultegra Di2 with Reynolds Strike wheels. In 2016, I got into ultra endurance cycling. In 2018, after training for a couple of years I qualified for the 3,000 Race Across America (RAAM) bicycle race by riding 410 miles in the Sebring 24 hour bicycle race and winning my age group. At one point, was the #10 ranked competitive eater in the world, as ranked by Major League Eating. I retired in 2018. I have held the title world corn eating champion (and former world record holder) with 47 ears of corn in 12 minutes. I won the world cannoli eating championship once. I've been to the Nathan's Famous hot dog eating contest 6 times. It was fun while it lasted. All good things come to an end. This is my actual week's worth of fresh, organic, local vegetables and fruits. I also grow many different types of organic micro-greens and sprouts indoors in our NYC home. Here's wheatgrass.